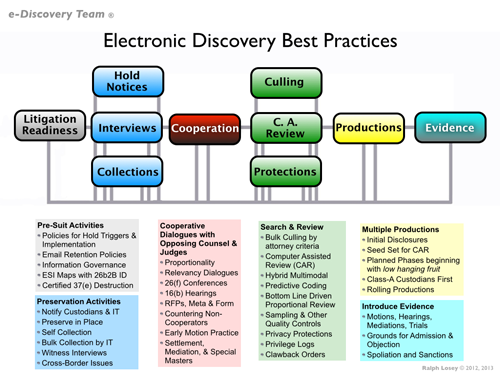 Judge Paul Grimm’s Discovery Order, which, to my knowledge, he now enters in every medium or large size case before him in District Court in Maryland, has just been included in Electronic Discovery Best Practices (found at EDBP.com). The assimilation of his order into EDBP was fairly easy because Judge Grimm’s Order reaffirms all of his many prior teachings and articles, and that of other e-discovery leaders. These ideas were already included in the EDBP, including the all important Cooperation activity that makes up the core of Judge Grimm’s order. Still, his order adds more details, and a few specific requirements that are new and good. All judges, state and federal, should adopt a discovery order like Judge Grimm’s. 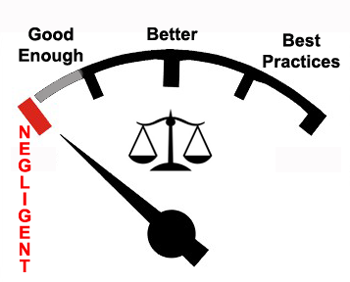 That would help advance the cause of attorney adoption of best practices. It would also help judges’ dockets flow more smoothly and with less e-discovery hassles. This class will conclude with a summary of the key requirements of Judge Grimm’s standing order. Still, you should read it in full here, and also look at the larger EDBP site to see how Grimm’s Order has been incorporated into the larger matrix. EDBP is a model of legal services that attorneys provide to clients, not of vendor services or lit-support services, which is pretty much the same thing. For that reason it contains many unique characteristics not included in the better known EDRM, including Cooperation. 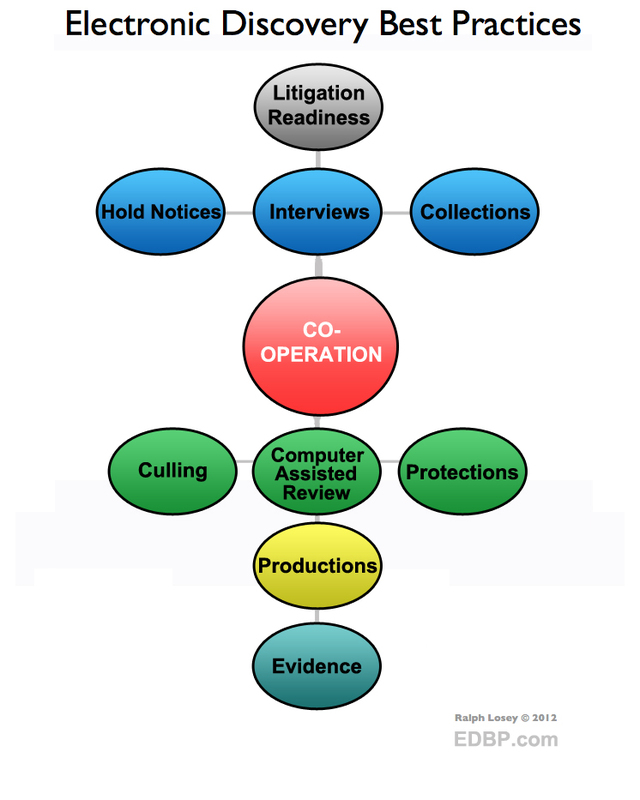 Practicing lawyers should learn the EDBP workflow of legal services. 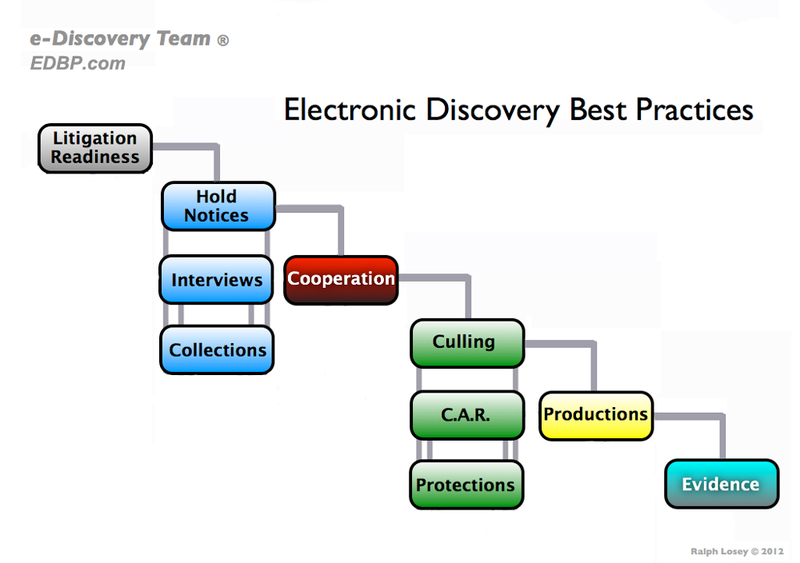 Students of e-Discovery Team training should also have at least a passing familiarity with the EDRM. There are thousands of articles written on good old EDRM, so we no longer include it in this training program. Instead, we urge you to visit EDBP.com and carefully study e-discovery legal services. First, it is important to note that Judge Grimm’s Discovery Order is an actual Order that he enters at the beginning of many cases. It is not a recommendation, guideline, or suggested protocol. The Maryland District Court’s Suggested Protocol for Discovery of Electronically Stored Information is a separate document that remains in effect. If you do not follow a Suggested Protocol, you may get a grim scowl and a tsk-tsk. If you do not follow an Order, you may go to jail. Just ask Victor Stanley. Even though the Maryland ESI Protocol is a recommendation, not an order, it is still a valuable document for all e-discovery attorneys. It contains good advice for best standards, especially concerning 26(f) conferences. I cannot think of a more complete checklist for possible ESI issues to be addressed at that conference. The Judge Grimm Discovery Order goes well beyond serving as a guide to 26(f). It requires attorneys and parties practicing before Judge Grimm to conduct discovery proportionally, and then goes into specifics as to what that means in his courtroom. Proportionality is the essence of this entire order. Proportionality is in turn a key component of another theme in Judge Grimm’s Order, Cooperation, which is the fifth and perhaps most important step in the EDBP. 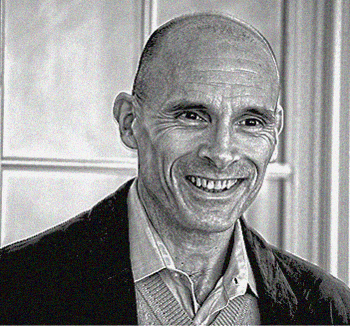 The Order does not just invoke vague concepts. It specifies that any discovery is disproportional that exceeds certain specified limits, at least to phase one discovery. These phases are also defined in the Order. Any discovery beyond the permitted scope is forbidden absent a motion establishing good cause and an order from the court. Moreover, the standard Discovery Order goes on to state that if the court determines that additional discovery is appropriate, the Requesting Party will be required to show cause why it should not be ordered to pay all or a part of the cost of the additional discovery sought. RFPs shall have no more than 15 categories of documents. Only 10 custodians shall be searched. ESI more than 5 years old shall not be included. Only reasonably accessible sources shall be searched. reviewing that ESI for responsiveness, confidentiality, and for privilege or work product protection. The producing party must be able to demonstrate that the search was effectively designed and efficiently conducted. A party from whom ESI has been requested must maintain detailed time records to demonstrate what was done and the time spent doing it, for review by an adversary and the Court, if requested. Parties requesting ESI discovery and parties responding to such requests are expected to cooperate in the development of search methodology and criteria to achieve proportionality in ESI discovery, including appropriate use of computer-assisted search methodology. These are meaningful requirements, especially since they are embodied in a court order. This kind of detail provides a good opportunity for a judge to sniff out who the true cooperators in a case are. It allows them to see through the facade of lies they are often presented with, where both sides accuse the other of being uncooperative. Sometimes that is true, sometimes both are non-cooperators (think Beavis and Butthead). But sometimes one side is making a bona fide good faith effort to cooperate, and the other side simply refuses. As we like to say in litigation, it takes two to tango. If the other side is stuck in a scorched earth discovery tactic mentality, they will never truly cooperate, but they may pretend in order to try to fool the judge. (Think of the famous phony Eddie Haskell on the Leave It To Beaver tv show.) I’ve seen this kind of tactic for years, especially by lawyers who suffer from ego inflation and like to egg their clients on by puffing about how aggressive and tough they are. It is not only immature, it is unethical. The best practice for discovery is Cooperation, and in Judge Grimm’s court that is mandatory. [T]he parties and counsel are expected to work cooperatively during all aspects of discovery to ensure that the costs of discovery are proportional to what is at issue in the case, as more fully explained in Mancia v. Mayflower Textile Services Co., 253 F.R.D. 354, 357–58 (D. Md. 2009). The failure of a party or counsel to cooperate will be relevant in resolving any discovery disputes, including whether the Court will permit discovery beyond Phase 1 Discovery and, if so, who shall bear the cost of that discovery. Whether a party or counsel has cooperated during discovery also will be relevant in determining whether the Court should impose sanctions in resolving discovery motions. See how he is tying cooperation to money? Good work judge. That kind of penalty is the only thing the Eddie Haskells of the world understand. As important as proportionality and cooperation are, there is more to Judge Grimm’s Order than that, much more. 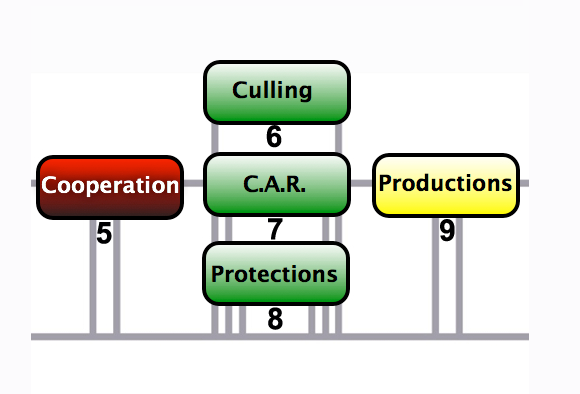 Perhaps the most important additional aspect of the Order is the Clawback provision, which fits into step 8 of the EDBP as part of Protections. In accordance with Fed. R. Evid. 502(d), except when a party intentionally waives attorney–client privilege or work product protection by disclosing such information to an adverse party as provided in Fed. R. Evid. 502(a), the disclosure of attorney–client privileged or work product protected information pursuant to a non-waiver agreement entered into under Fed. R. Evid. 502(e) does not constitute a waiver in this proceeding, or in any other federal or state proceeding. Further, the provisions of Fed. R. Evid. 502(b)(2) are inapplicable to the production of ESI pursuant to an agreement entered into between the parties under Fed. R. Evid. 502(e). . . .
We agree with Judge Scheindlin, who, with Judge Grimm by her side at a CLE several years ago, shortly after 502 was enacted, wondered aloud why all judges did not simply enter a 502(d) order in all of their cases, instead of waiting for lawyers to do it, and perhaps screw up in the process. Now Judge Grimm has done just that. 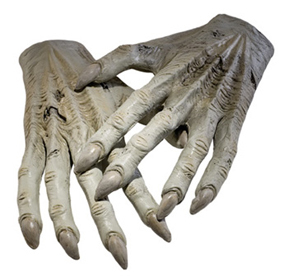 He enters the 502(d) broad scope claw back protection order sua sponte, and does so, as far as I can see, in all cases where there is likely to be e-discovery. A handful of other judges around the country are starting to do the same. Count yourself lucky if you are one of the few lawyers in the country with an enlightened judge like that who is attempting to rehabilitate and use the often misunderstood provisions of clawback Rule 502. If you are in the vast majority, and your judge does not have a standing 502(d) order, then by all means raise the issue. Ask for blanket protection under Rule 502(d) and avoid the reasonable efforts gotcha provisions of 502(b)(2) (“the holder of the privilege or protection took reasonable steps to prevent disclosure”). See eg. Innovate Conference Report: Judge Facciola and Judge Nolan to Speak on Clawbacks, Cooperation and Competence; Another Clawback Enforcement Order Shows the Importance of the Selection of Quality Vendors; and, Clawbacks: Trick or Treat?. 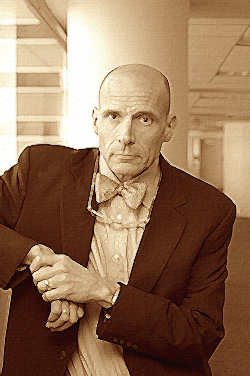 As we all know many attorneys these days are mere poser cooperators. They are in truth dementors in disguise, just waiting to steal your clients secrets in large-scale productions. Large scale reviews are dangerous and expensive. 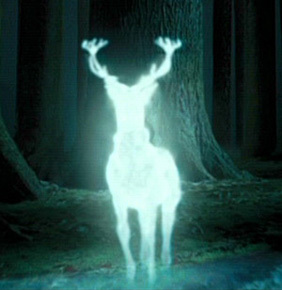 All good lawyers need the Harry Potter type protective Patronus spell that only a 502(d) order can provide. 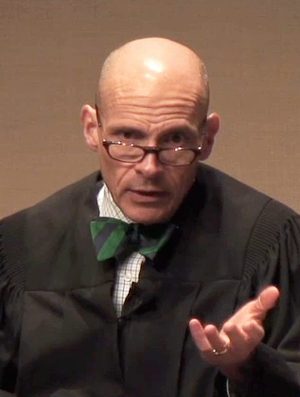 The Discovery Order Judge Paul Grimm uses in his cases serves as an excellent best practice model for all judges and attorneys in the country. While different proportionality limits may be used that vary from Judge Grimm’s suggested maximum limits of 15 categories, 10 custodians, 5 years, and 160 hours, this is a good start for most sophisticated litigation. Of course, even Judge Grimm’s maximums would be overkill for the average small federal case, and I doubt he enters this order for such cases. Many small cases can be fairly and proportionally resolved with discovery from only three custodians, or perhaps only one. It all depends on the case. The same comment applies to the 160 hours. At only $350 per hour, which is on the low side for federal litigation, that would be an expense of $56,000.00. This would be far too much time and money to spend on document disclosure in an average case with only $100,000 in damages. Proportionality depends on the particular facts and issues in the case. It depends, among other things, on the likely value of the case and value of the proposed discovery. SUPPLEMENTAL READING: Look around the EDBP.com web. This collection of best practices is advanced materials, but should be a good reference for your future work. It is worth spending time familiarizing yourself with the basics. You should at least understand the difference with the better known EDRM. EXERCISE: Study Judge Grimm’s entire order and consider what segments would be inappropriate or unnecessary for small cases.